The bow season is over and what should you do with your bow? Preparation for compound bow maintenance and storage is key to a successful hunt and also keeping your bow shooting straight for years to come. How you store it and where you store it is also key. You can ruin a bow easily just from where you keep it. Like pretty much everything out there, especially mechanical gear like your bow, you will need to keep it clean, free of dirt and everything lubed up. 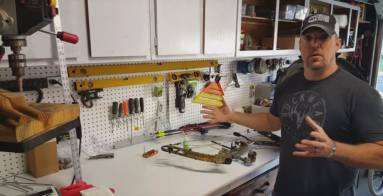 Compound Bow Maintenance is a practice that is as important as cleaning your guns. Same concept, so stick with the same practice. In the video below, I go over a quick and easy way to keep your bow shooting like new for many many years. This is something I would suggest to do at least every couple weeks depending on your usage. Get yourself a good oil and keep all the bearing joints lubed up. In the video I used a product from Wolf Premium Oils. They developed an archery specific oil designed to be used on the entire bow. The Wolf Archery Oil is an innovative synthetic oil to be applied to pulleys, cams and strings. So no need to mess with the tube of wax that in a pain to apply sometimes. Simply add a few drops and rub it in the string or like any oils in joints, just drop and work the bow so the oil gets in the joints and bearings. All the maintenance in the world won’t mean a darn if you overlook where your bow is stored. Heat a humidity is a true killer of all and it will destroy your bow. So keep your bows in the house and don’t leave in the garage or barn. If the bow sits in the heat too long, the limbs will begin to deform which will throw your timing and alignment off. Keep your bow inside while in storage and don’t neglect them. Check out the video below of what I am doing to prepare my bow for long term storage. Do me a favor and please subscribe to the Youtube channel.